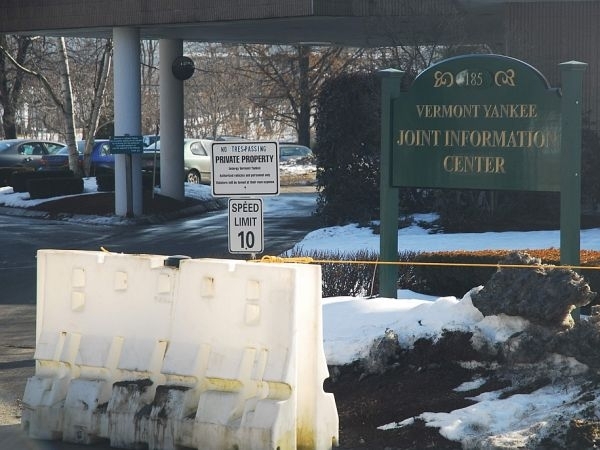 (Host) State utility regulators are trying to sort out how much authority they still have over the Vermont Yankee nuclear plant. A federal court has ruled the state can’t regulate safety issues at the plant. But as VPR’s John Dillon reports, regulators are looking at whether the plant can store more nuclear waste. And they’re asking about issues that cross the line between safety and reliability. (Volz) "This is a status conference in Public Service Board docket number 7440, which is the petition of Entergy Nuclear Vermont Yankee LLC and Entergy Nuclear Operations for amendments of their certificates of public good." (Dillon) The Public Service Board kicked off the hearing with a number of questions for Entergy Vermont Yankee. A big question has to do with safety. The federal court said safety is off limits for state regulators. But board member John Burke said some issues include safety, reliability, and cost. (Burke) "Let’s take the gorilla on the couch. The buried pipes. Entergy could take that as safety and safety and safety. But in fact that came up in the discourse involving how much the cost of decommissioning was going to run." (Dillon) A second question has to do with nuclear waste. P-S-B Chairman James Volz cited state law that says Yankee can’t store waste on site that’s generated after March 21. (Volz) "If you read 157 there’s a section in there that specifically says we only have authority to approve a facility … for fuel generated through operation up to March 21 2012. So where do we get the authority to go beyond that?" (Dillon) Entergy Vermont Yankee argues that another state law allows it to operate and store waste so long as it has applied for a new state license. The state agency that represents utility ratepayers agrees with Entergy that it can keep operating while the board reviews its new license. But Entergy lawyer Robert Hemley pointed out that the company has gone back to federal court for a definitive ruling for the right to keep running. Hemley reminded the board that it is a defendant in the original federal court case Entergy won in January. He pushed the board for a decision, and suggested further court action was an option. (Hemley) "We need some certainty as to the board’s position between now and March 21, or we need to obtain it from another source." (Dillon) PSB Chairman Volz had a quick reply. (Volz) "I don’t think we’ve been asked to rule on that…. It’s certainly within your power to file something and ask us to rule and we can go from there. Whether it can happen by March 21 now that you’ve waited this long I have no idea." (Dillon) Meanwhile, an anti-nuclear group argued that the plant cannot legally operate past that date. Jared Margolis represents the New England Coalition. He says a 2002 board order put in place when the plant was sold is very specific about what Entergy can and can’t do after March 21st. He says the order limits Entergy’s ownership -quote – "solely for the purpose of decommissioning." (Margolis) "The license itself only allows them to decommission the plant after March 21st 2012. It does not allow them to continue to operate the plant after March 21st, 2012." (Dillon) The board didn’t rule on that question, or the other complex legal issues. With the big March 21 deadline looming in less than two weeks, the PSB wants to hear back from Entergy and the other parties by March 16.